Traditionally associated with love potions and aphrodisiacs, lovage was originally called luveshe (Old French) or "loveache". It originates in the eastern Mediterranean, although it is now widely naturalised. 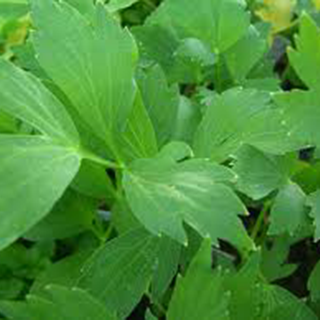 A culinary herb used in stock cubes, lovage is also used for treating various digestive, respiratory, and urinary problems, and is generally warming for the circulation. The weak tea is a good treatment for infant colic, administered by the teaspoonful. The tincture of the root or seeds is stronger than that made from other parts of the plant. This has been used as a substitute for dong-quai (Angelica senensis), providing many of the same benefits. Add 1/2oz (15g) of the root to 11/2 pints (900ml) of water and simmer to reduce the volume by one third. Take 1/2–1 cup up to 3 times daily for indigestion, cystitis, rheumatism, gout, poor appetite, or painful menstruation. Combines well with an equal amount of agrimony infusion for indigestion. Take 20–60 drops (1–3ml) of the root tincture in warm water 3 times daily for indigestion, poor appetite, urinary tract problems, or period pain. Take every 2 hours for colic. Use 1 cup of the root decoction as a mouthwash for mouth ulcers or as a gargle for tonsillitis. Chew 2–3 seeds to relieve flatulence and indigestion. Chop and add to casseroles to flavour the stock. The fresh herb is a nutritive and carminative addition, imparting a celery-like flavour. The smooth leaves can be smashed or blended with a little water to make a cooling, healing poultice. Prefers fertile, moist, well-drained soil in full sun and an open position; tolerates other conditions. Sow seeds when ripe in early autumn and transplant into position when large enough, or propagate by dividing established plants in spring. Gather leaves through spring and early summer, seeds in late summer or autumn, and the root in late autumn.